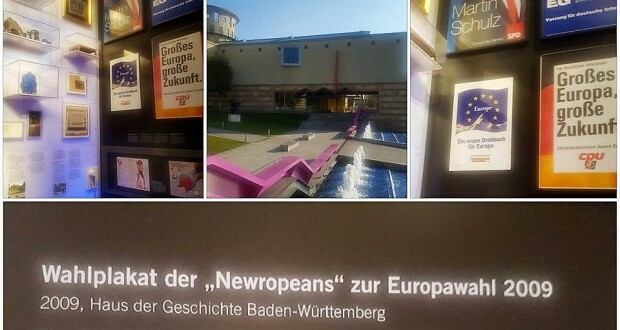 The House of History (Haus der Geschichte), the museum of history of Baden-Württemberg in Stuttgart, recently opened a new permanent exhibition called „Haus Europa“ (House Europe). This permanent exhibition deals with the following themes: Slaughterhouse Europe, Euro-Visions, the Europe of Monarchs, Politicians and technocrats, Europe as Common Market and Europe of the Citizens. Credit has to be given to Franck Biancheri, who was the founder of Newropeans. 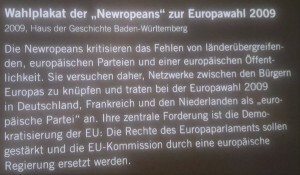 Europe of the Citizens, Euro-Vision, Democracy... are intrinsically linked to Newropeans and above all to Franck Biancheri who rightly deserves to figure in such a place of memory and history. 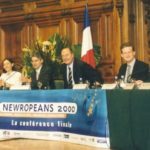 In October 2000, in order to celebrate the emerging of new generations of Europeans born after the Treaty of Rome, and contribute to invent tomorrow’s Europe, Franck Biancheri, prominent founding father of the Erasmus programme, in partnership with other organisations including AEGEE-Europe (that he had launched in 1985), organised a congress entitled “Newropeans 2000 – New Europe, New challenges, New generations” which gathered 2,000 young Europeans together with many heads of states and governments, ministers and European commissioners. 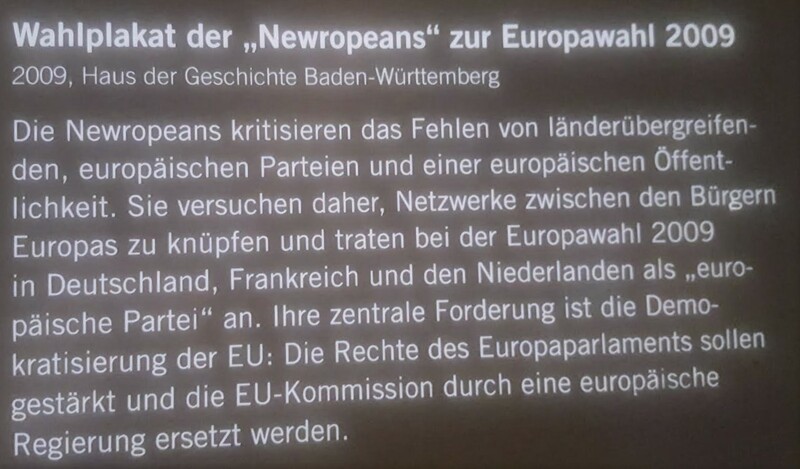 This Congress gave its name first to a citizen organization which then became a political party in 2005: Newropeans. 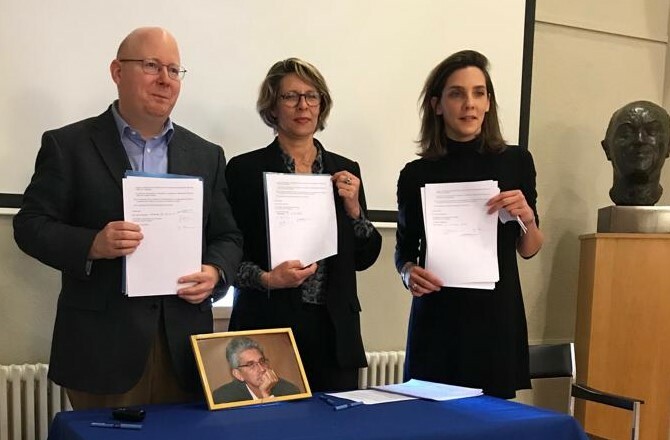 Fifty-three years after the Treaty of Rome was signed, at a time when the entire public life has become trans-European (currency, public services, circulation of goods and people, companies…), political affairs remain in the hands of national parties! It is in order address this absurdity and major danger for our democracies that Franck Biancheri with his road-companions decided to run with Newropeans – with no money and no media support – for the 2009 European election in three different EU countries: France, the Netherlands and Germany. 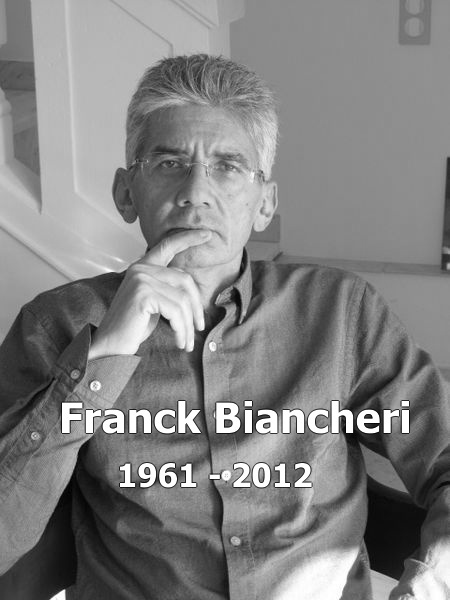 Franck Biancheri passed away aged 51 on October 30th, 2012, from a long illness he fought with as much courage and determination as he had fought the schlerosis of Europe’s political life all along his life. His willfulness gave him hope in men’s capacity to overcome History. The Friends of Franck Biancheri are proud that the legacy Franck Biancheri has left behind is now officially recognized in the History museum of a large city in Germany and thank the museum of history of Baden-Württemberg in Stuttgart for that. The citizens of Europe of today and tomorrow owe him that.